The semicircular canals of an animal’s inner ear controls its sense of balance. Their size can tell us whether an animal is slow and ponderous or fast and agile. They can even help us to reconstruct the behaviour of extinct species. Studying the way an animal moves by looking at its ears might seem like a poorly thought-out strategy. After all, short of watching it directly, most biologists would choose to look at more obvious traits like tracks, or limb bones. But while an animal’s limbs may drive it forward, its inner ear makes sure that it doesn’t immediately fall over. By controlling balance, it plays a key role in movement, and its relative size can tell us about how agile an animal is. When we walk, the image that forms on our retinas changes quite considerably. But no matter how fast or erratically we move, our view of the world neither jerks nor judders. It’s all stable images and smooth transitions, and the inner ear plays a large role in that. In the inner ear, three semicircular canals control our balance by acting like small gyroscopes. The canals are bony, fluid-filled tubes arranged at right angles to each other and send information to the brain about the body’s orientation. When the body moves, so does the fluid and this sloshing is sensed by hairs in the canals and relayed to the brain. The muscles of the neck and eye tense reflexively in response to these signals, and these help to stabilise our view of the world. In humans, the inner ear doesn’t really have to work too hard – we’re limited to moving on the ground, and not very quickly at that. It’s a whole different story for a fast and agile animal like a bat, twisting and turning in three-dimensional airspace while avoiding obstacles and predators. Fred Spoor from University College London and colleagues from around the world reasoned that these different movement styles must be reflected in the size of a species’ balance organs. There is some evidence for this already – the practically immobile sloths have small semicircular canals, while manoeuvrable birds have relatively large ones. But these findings seem almost anecdotal compared to the massive amount of data that Spoor collected. His group looked at the canals of 91 different species of primates, representing all the major families. The primates are an ideal group for this type of analysis – despite being closely related, they have a vast range of different movement styles. Acrobatic gibbons swing through jungle canopies at high speed using ball-and-socket-jointed wrists (top). At the other end of the spectrum, the appropriately named slow loris is a ponderous and stealthy climber (bottom). The group used a special CT scanner, a hundred times more sensitive than those used by hospitals, to build detailed 3-D reconstructions of the skull of each species, and the three canals inside. As well as the primates, they also looked at 119 other mammals, from mouse to elephant, and gave each one a score from one to six, based on how swift or agile they were. As predicted, they found that the canals of agile animals with fast, jerky movements like tarsiers (image below, left) are larger for their body size and more strongly curved. Slower species like lorises have relatively small and less curved canals. Spoor’s data suggests that the size of the semicircular canals are an important adaptation to give fast-moving animals greater stability. It explains why some primates can gracefully race through dense treetops at speeds where humans, with out relatively smaller canals, would embarrassingly collide with a branch. Just look at this amazing video from the Life of Mammals, of various lemurs (and their predators) moving through the trees. This method can also be used forensically, to recreate the movement styles of extinct mammals. To prove this principle, Spoor looked at the canals of several species of extinct lemur, and found that their canals gave important clues about their behaviour. 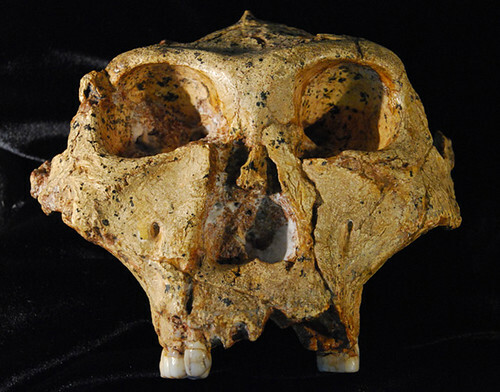 Of the species he looked at, Palaeopropithecus (image above, right) had by far the smallest canals for its size. Accordingly, palaeontologists believed it was the lemur equivalent of a sloth; its hands and feet are curved for hanging from branches, and its wrists and ankles have lost the flexibility needed for effective walking. 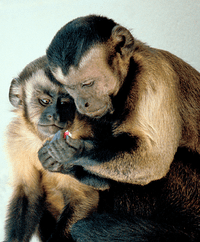 Using a simple psychological test, scientists have found that monkeys can use simple statistical calculations to make decisions. They even managed to catch individual neurons in the act of computing. Say the word ‘statistician’ and most people might think of an intelligent but reclusive person, probably working in a darkened room and almost certainly wearing glasses. But a new study shows that a monkey in front of a monitor can make a reasonably good statistician too. Tianming Yang and Michael Shadlen from the University of Washington found that rhesus macaques can perform simple statistical calculations, and even watched their neurons doing it. Psychologists often train animals to learn simple tasks, where the right choice earns them a reward and the wrong one leaves them empty-handed or punished. But real life, of course, is not like that. Mostly, there are risks and probabilities in lieu of guarantees or right answers. Animals must weigh up the available information, often from multiple sources, and decide on the course of action most likely to work out in their favour. Yang and Shadlen tested this decision-making ability in two rhesus macaques using a variation of the well-known weather prediction task used to test human volunteers. In the human version, people are shown a series of cards that represent various probabilities of good or bad weather. After some training, they are shown combinations and asked to predict the likely weather from these. The monkeys had a slightly simpler task – they had to look at either a green or a red target. If they picked the right one (which changed from trial to trial), they were rewarded with a tasty drink. To help the monkeys choose, Yang and Shadlen showed them a series of shapes that represented the probability that the rewarding target was red or green. For example, a square strongly indicated that the red target was the rewarding one, while a triangle strongly favoured the green one, and an hourglass only slightly favoured the green. The monkeys were shown four shapes out of a possible ten, and to get the right answer, they had to add up the probabilities indicated by these shapes. And that is exactly what they did. They learned to base their decisions on the combined probabilities of the four shapes, and chose the appropriate target. It did, however, take them a while to learn (or two months of training with over 130,000 trials to be exact). Any statisticians reading this don’t need to fear about being replaced by monkeys any time soon. They weighed up the strength of the evidence too. When the shapes strongly suggested one colour, the monkeys almost always went with that colour. When the summed probability lay between the two extremes, they chose either target but still favoured the one indicated by the shapes. With 715 different combinations of shapes, the experiment’s design makes it highly unlikely that the monkeys simply memorised the ‘answers’ for different mixes. And because the shapes only dealt in probabilities, it was still possible to choose the wrong target, even if the monkey strictly adhered to the shapes’ advice. They were clearly reasoning with probabilities, and in pretty subtle ways. For their next trick, Yang and Shadlen visualised this reasoning directly by looking at 64 neurons in the monkeys’ lateral intraparietal area (LIP). This part of the brain is responsible for several higher functions like mathematical skills. Other studies have found that the LIP collects data from the visual cortex, and helps to process what the monkey sees. When the monkeys saw a shape, the activity of their LIP neurons was proportional to the probability indicated by that shape. As the four shapes were shown in sequence, the neurons altered their rate of firing to account for the new information. As the evidence was building up, the monkeys were busy doing sums in their heads. Yang and Shadlen were seeing arithmetic in action. Of course, monkeys are living things and not fuzzy calculators, and they were not equally good at statistical reasoning. One was clearly better than the other, and Yang and Shadlen put this down to differences in their neurons. Each neuron varies slightly in its typical firing rate, and summed together, these variations can lead to biases in how the monkeys deal with calculations. This explains why the monkeys sometimes did different things when shown the same combination of shapes. Their confusion was particularly apparent when the shapes gave no strong inclination to pick one target or another. We can certainly relate to that – after all, it’s certainly harder to make a decision, when neither option seems particularly better than the other. Yang and Shadlen believe that human brains use similar methods to make decisions. Cues about probabilities are funnelled into the brain’s control centres (like the LIP), which act like calculators powered by the firing of neurons.